Whether you're installing, removing or maintaining your hot water heater, it's important to know how to turn it off, power it back on and reset it. Regardless of whether you have an electric or gas-powered unit, there are certain safety rules you must follow during this process. Adhering to manufacturer instructions is also essential. 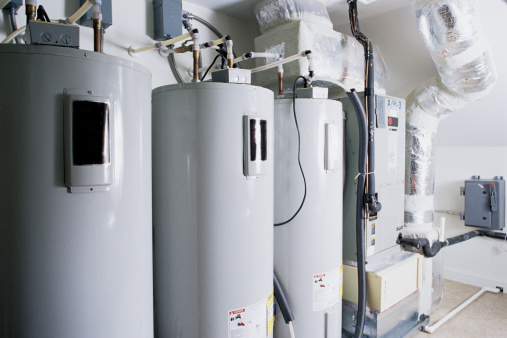 Before you begin the process of installing or turning on your hot water heater, be sure that the circuit into which the appliance is connected is turned off. This is an important safety consideration and should not be overlooked. Once the circuit is turned off, it's safe to proceed. Note that if you have a gas water heater, you'll want to perform the same safety step by ensuring that the dial on the thermostat is turned to off. Before turning on the appliance, you should close any open faucets. If you had been working on the water heater, you might have opened a hot water faucet to let air into the tank. In order to restore the system and turn it back on, you'll need to turn those faucets off. Next, turn on the tank's cold water supply and let it refill. You should never attempt to fill the tank with hot water or heat a tank that isn't properly filled as doing so can cause serious damage. For gas water heaters, you'll next need to relight the pilot, then switch the gasoline valve to the on position. For electric heaters, you can restore the circuit. At this point, the water heater should resume heating your water. 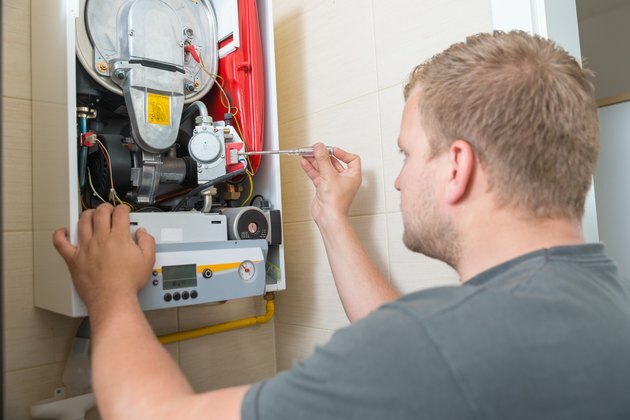 If you will be replacing your electric hot water heater or if the one you have seems to be malfunctioning, it's critical that you turn it off quickly and safely. Some homeowners like to periodically drain the water from these appliances, too. No matter the reason for turning off the hot water heater, certain safety considerations must be adhered to. Before you proceed, turn off the circuit breaker for the hot water heater. This is an essential first step to ensure your safety. Once again, for gas hot water heaters, ensure that the dial on the thermostat is turned to "off." Once the circuit has been turned off, you may proceed. You will need to turn the appliance's water supply off. To do so, turn the valve clockwise until you can turn it no longer. This should stop the flow of water. If it does not, you will need to temporarily turn the water off at the entrance valve for the entire house. As soon as the water has been turned off, you can drain the hot water heater. Attach a hose to the drain valve on the appliance, which you should find located at the bottom of the tank. The water you will be draining will be hot and may be filled with rust or other deposits. You should run the drain hose into a large basin, sink or outside so that you don't ruin any finished surfaces. Turning on a hot water faucet somewhere in the house, provided you didn't have to shut the water off at the main point of entry, can be helpful to let air inside the tank. Very carefully, open the valve at the base of the appliance to let the water drain. Depending on the model you have, this will mean flipping the valve so its handle is either straight up or straight out. Be cautious while undertaking this step. The water you are draining will be extremely hot and could easily cause injury. If you have a gas-powered hot water heater, you may occasionally need to reset the pilot light to keep the appliance working properly. Before proceeding, you should refer to the appliance instructions to be sure you follow them correctly. In most cases, the manufacturer will advise you to begin by turning the gas valve to "off." After waiting a few minutes, you should then turn the valve to the "pilot" setting. Hold the valve – or, on some models, a nearby red button – down to encourage the flow of fuel into the water heater. Continue to hold the button until the pilot lights. If you have a model that requires manual lighting, use a long-handled lighter to ignite the pilot. Keep holding the button down for about one minute after you have lit the pilot. This should resolve most simple problems of the pilot light going out. For more complicated repairs, contact a skilled technician.